Thud. 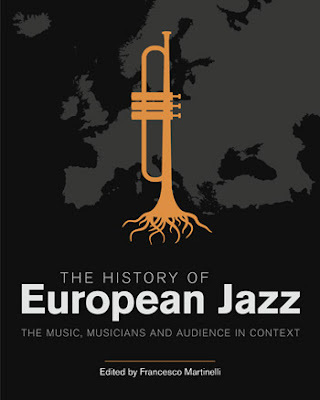 The History of European Jazz really is quite some book. It weighs in at over 2.1kg. The retail price is £195 or $280. It is 742 pages long, has been several years in the making, and consists of 34 chapters on different countries, plus six additional chapters on different themes. Only a single author has contributed more than one of these country chapters, and there are four country chapters which have more than one author, so that makes a total of nearly 50 contributing writers. One key question is who the book is addressed to. The book adheres to the general principle that Equinox, the book’s publisher, follows throughout its extensive jazz catalogue, led by Alyn Shipton. As he explained to me in a different context recently: "the university-based ‘jazz studies’ market has grown, but at Equinox we prefer our music books to cater for academics, enthusiasts and the general reader". That principle of wanting to inform and to appeal to the general reader runs through the book. Editor Francesco Martinelli entitles his foreword “stories that needed to be told,” and describes part of the process as a “‘stitching-together’ of stories in a jazz quilt covering the whole of Europe”. That is to say that the cultural, historical and economic contexts in the different countries are never the same. And the approach of allowing a specialist from the country concerned to tell each story gives that authentic sense of where the music comes from. But stories need good story-tellers, and there are those who can and, unfortunately, some who can’t. It is not surprising, for example, that the story of Irish jazz is well told by Cormac Larkin. His chapter starts with the improbable narrative of 3,000 people led by Father Peter Conefrey, a Catholic priest with strong nationalist leanings, trudging through the cold on New Year’s Day in 1934, holding placards emblazoned with slogans such as “Down with Jazz” and “Out with Paganism”, and ends musing on what Father Conefrey would make of the jazz scene that he would look down on today. Another superb story-teller, Gábor Turi, gives us the chapter on Hungary. It is clearly written and develops in a way that the ‘general reader’ can certainly enjoy. More broadly, the story of jazz’s problematic relationship with communism comes across with passion many times, notably in the chapter about Poland. In Bulgaria, there are stories of tough times when musicians were rounded up and imprisoned. In the chapter on Ukraine the writer is almost certainly describing similar circumstances when he reverts to dark euphemism, alluding to jazz practitioners’ “sense of instability as the authorities’ ‘heightened interest’ routinely recurred”. The history of jazz in Germany is broader and more complex, but I found the chapter dealing with it rambling and hard to follow. There is a lot of information there, but it it doesn’t really have threads to help the reader through it, and whereas several writers elect to give a resounding and strong conclusion, this chapter peters out rather inconclusively. Jazz is based on open-mindedness, open ears and a willingness to be influenced. And what I have found fascinating has been to follow the stories and the characters that cross borders and appear in several chapters. One of them is neatly flagged up in Alyn Shipton’s introduction, and that is the story of trumpeter Adi (Eddie) Rosner whose activities span Germany, Poland and the Ukraine. He also pops up in the chapter on Jewish musicians, and, intriguingly and briefly, in the one on Azerbaidjan. And there are plenty of characters whose influence pops up all over the place. Sometimes these appearances are caught in the index but often they are not. Kenny Wheeler’s influence is deep and far-reaching, and he makes un-indexed appearances in the history of jazz in both Belgium and Italy. And then there are influential figures who could pop up more or less anywhere. I couldn’t have predicted, for example where the British writer and commentator Stuart Nicholson would receive the most references. His remarks about the links which jazz has with theatre and parody, and his description of the ‘rugged individuality’ of its creators earns him a prominent mention... in the chapter about the Netherlands. Some chapters – the one on the UK for example – describe the current scene in detail, whereas the chapter on Norway leaves itself less than a page to fast-forward from 1980 to the present day. So the only reference I could find in it to the oft-vaunted jazz educational miracle of Trondheim consisted of the names of three musicians and a passing reference to it as a “jazz-friendly student town”. And then there are those influential figures who, one hopes, might receive their dues because of deep and transformative effect they had on the scene around them. The question is whether a) being astonishingly good at what they did and b) quietly going on doing it for decades would prove to be enough. Danish musicians have often talked to me of the reverence in which they held legendary pianist Horace Parlan who spent most of his later life in their midst. But in the chapter on Denmark he gets just one cursory reference and doesn’t make it into the index. A few such passing regrets in an enterprise of this size are inevitable, and they should not detract from the gold-mine of information and of bringing-to-life that is there. As so much information goes online, books on this ambitious scale are increasingly a rarity. The facts that this one has received the backing to actually come into being, and that it has been done this well, is nothing short of a miracle.